Mehsana (Gujarat): Mehsana, the hub of the Patidar agitation, is a sometimes bumpy 35-km bus ride from Vadnagar, the hometown of Prime Minister Narendra Modi. The conductor struggles to make himself heard in the raucous group, mostly BSc students in a local college voting for the first time on December 14, phase two of the Gujarat polls. Mehsana and Vadnagar fall in Mehsana district. However, Vadnagar falls in the Unjha constituency while Mehsana city is a separate constituency. But politics is not uppermost in their minds. 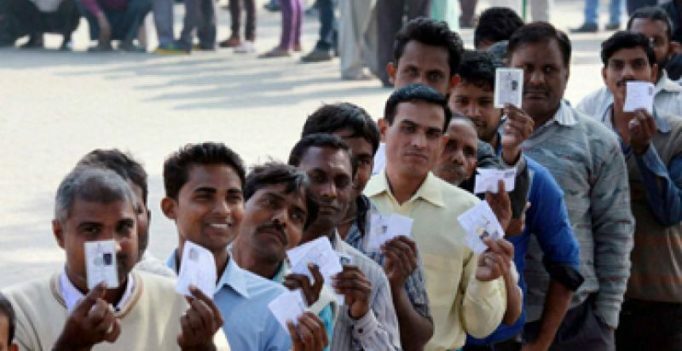 The first-time voters, who form a crucial voting block of 12 lakh, seem to be just waking up to political consciousness – somewhat like the faint fuzz on their upper lip. Ashish, a Kadva Patel (a subcaste of the Patidars or Patels), is an ardent supporter of Hardik Patel, the firebrand leader of the Patidar Amanat Andolan Samiti (PAAS), which has been fighting for reservation and has come out in support of the Congress. The 21-year-old is the son of a land-owning farmer in Visnagar, a major pitstop between Mehsana and Vadnagar. “Patels are not necessarily wealthy. None of us has government jobs. The land we own is not enough to feed our entire family. That is why we need reservations,” says Ashish, justifying his support for Hardik Patel. According to him, a false perception that Patels are dominant in all spheres of society has gained traction, leaving the economically backward among them in the lurch. Patels form around 12 per cent of the electorate and among them Kadvas, to which Hardik and Ashish belong, are fewer in number. They can potentially influence the outcome of around 60 seats out of the 182 in the state, say analysts. However, Jashavant is not impressed with Ashish’s argument and is convinced that the BJP will make a resounding comeback for a fifth term. “State government employees get a sense of the electorate’s mood better than anyone else,” he says. “And why should the BJP not win? Modi has brought in development, he is one of us,” he adds, pointing to Modi’s local roots. “Vadnagar is all about Modiji, who is himself an OBC. No other party will register any presence. There’s development all around us,” Vikas says, while others helpfully point to an upcoming medical college in the area. They all hope to pursue higher education degrees and land government jobs. OBC leader Alpesh Thakore, on whom the Congress is banking for a chunk of OBC votes, finds resonance but whether or not that will translate into votes is still to be seen. “We have heard he has worked a lot for the community and would have voted for him only if he had been with the BJP,” says Nikhil. For the debutants, what matters is development and jobs. Issues like the 2002 riots matter little to these youngsters, mostly in their early 20s who were probably just beginning school at the time. When the topic is brought up, they don’t show much interest, many saying they are aware that something had happened but have no “deep” understanding. “My family has been traditional Congress supporters. I am not much into politics but why not give Rahul Gandhi an opportunity? He appears to be a sincere person,” says this son of a landless farmer. Mevani shot to fame when he organised a series of protests against atrocities against Dalits. As the bus reaches Vadnagar, the youngsters rush out. “Do write that we all studied in the same school where Modiji studied. It’s right across the railway station where he sold tea as a child,” one of them shouts out. The first phase of the Gujarat election is on Saturday and the second phase on December 14. The results will be announced on December 18.